Late one winter night, Ms. Mercier awoke to find herself trapped in her third story apartment by a fire in the exit hallway. Due to the hillside location, the fire department ladders could not reach her. The fire burned through her front door and trapped her on her balcony. With flames breaking through her balcony door, she suffered 3rddegree burns over 70% of her body before a ladder engine could rescue her. We performed an investigation and determined that several factors lead to this tragedy. First, the high-temperature limit switch on a Cadet baseboard heater in a neighboring apartment failed and caused the heater to overheat. This high heat ignited a nearby tablecloth. Second, the smoke alarms were not working in the origin apartment. The shrieks of a pet parrot awoke the tenant in this unit who left her apartment in a rush without closing her door. Third, there was not automatic door closure device from the apartment door to the fire egress hallway. The fire spread quickly to the hallway and trapped Ms. Mercier. Fourth, the fire-rated door on Ms. Mercier’s apartment was installed without fire sealant around the frame. The fire burned through the casing in less than 5 minutes and spread into Ms. Mercier’s apartment. During the morning preparation period before the lunch crowd rush, a fire started in the Chicken! Chicken! Restaurant in Burlingame, CA. The fire quickly spread through the building and destroyed two neighboring businesses resulting in a multimillion dollar loss. Working with architect Dennis Govan, AIA, and fire investigator Russ Auker (Ron Hall & Associates), we created a detailed set of as-built plans of the building, structure, restaurant, oven enclosure, oven hood & fire suppression system, exhaust duct system, & supply duct system. We located the origin of the fire in the attic space above the oven enclosure. We also demonstrated that there were no ignitions sources near the origin. WCP&A then created a detailed combustion, heat transfer, & fluid flow model of the oven and enclosure. Using this model, we demonstrated that the ignition source was self-heating to ignition of the wood framing above the oven. We demonstrated that the proximate cause of the high temperatures that allows this self-heating to occur was breakage of a fan belt to the exhaust duct fan. We demonstrated that the design of the oven was not suitable for use with a standard food-service-equipment hood or being framed into an enclosure; this was a violation of a variety of codes and standards. At 1:00 AM on September 15, 2005, Ms. Estrada was severely injured in a 3 alarm fire that killed three other people. WCP&A reconstructed this fire and determined that Ms. Estrada first smelled smoke in her 3rd story walk-up apartment in San Francisco’s Mission district. She arose to discover that her exit was blocked by fire in both her main and exit stairways. Her husband was killed by smoke inhallation. Her daughter burned to death trying to escape down the flaming stairs. And Ms. Estrada was severely injured after she fell from a third story window gasping for fresh air before the fire department could arrive. WCP&A reconstruction demonstrated that the entry fire door failed prematurely, the smoke detectors in the unit did not function, and the main fire alarm did not sound. A fire erupted in one of the of a tilt-up commercial building. After the fire was extinguished, the fire department discovered the corps of a father and son in the loft above the office in his shop. 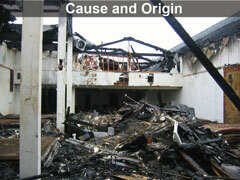 We investigated this fire and readily determined that it was arson and murder. A pool of gasoline had been poured onto the floor inside the loft. This pool was connected by a trail of gasoline to another pool outside the door to the loft. This pool was connected to a final pool of gasoline at the base of the stairs to the loft. Once ignited, this gasoline would create a wall of flame that blocked off all escape from the loft. We also modeled the fire growth rate, the smoke production rate, and the CO production rate. From this we determined that the fire in the loft would have flashed-over before the man and his son died from smoke / CO inhalation. We also determined that a properly functioning smoke alarm would have alerted them to the danger in time to escape, if they had anywhere there could have run.